One of our clients, Paragon 360, a unique audio and visual design/build company based out of Springfield, Missouri. 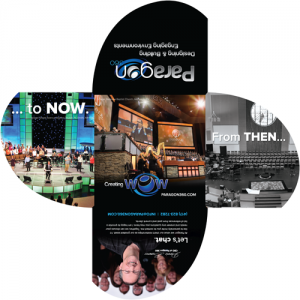 Paragon 360 specializes in environment creation for large companies, theaters, and worship centers. Their team of multi-talented designers and technicians travel nationwide updating and building state-of-the-art audio and visual environments. From a full auditorium redesign for Bellevue Baptist Church in Memphis, Tennessee; to Wal-Mart Stores, Inc.’s Annual Managers Meetings; Paragon 360 has built a portfolio of impressive projects over the last thirteen years. When asked by the Paragon 360 folks to produce a new brochure, the Red Crow Marketing team delivered a dynamic design that takes the reader on a linear journey. The copy was written to clearly and succinctly focus on Paragon 360’s benefits and unique sales positions, as well as address prospects primary questions and concerns. Dramatic before and after transformation imagery was also added to demonstrate the imaginative architectural and design services Paragon 360 offers. 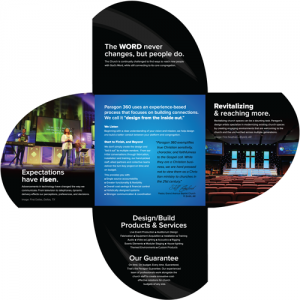 The deliverable was a four-panel die cut design that allows Paragon 360’s information to be strategically arranged and revealed one piece at a time. The new brochure will make its debut at the annual Southern Baptist Pastors’ Conference in Baltimore, Maryland in early June. The Red Crow Marketing team is excited to see the response to this new piece of strategically designed collateral and what it can do for Paragon 360.